Below are press releases published by Foot Levelers over the past two years. Roanoke, Virginia – Feb. 28, 2019 -- A collaborative partnership was announced today between Foot Levelers, the world’s leading provider of hand-crafted custom orthotics, and Women Chiropractors (WDC), a not-for-profit professional organization dedicated to raising up women leaders in the Chiropractic profession. In support of these aspirations, Foot Levelers formalized the relationship on February 14, 2019 and has made a $100,000 donation to help WDC expand its resources. We're Vegas-Bound, Baby! With A New Kiosk, New Products, And A New Mascot For Foot Levelers' Biggest, Boldest Parker Experience Yet! ROANOKE, VA February 21, 2017—Foot Levelers turns 65-years-young this year, and fueled by the birthday spirit the team is headed to Parker Experience Las Vegas, one of Chiropractic’s largest annual events. Featuring hundreds of exhibitors, dozens of presentations and thousands of attendees from all over the world, Parker Vegas is the perfect venue for Foot Levelers to let its latest and greatest shine. ROANOKE, VIRGINIA–MARCH 2016–Abby Oliver isn’t “just” an integral member of the Foot Levelers’ Customer Service team. She’s also a decorated former University of Richmond basketball star who later played pro overseas—and now she’s in training for the notorious Foot Levelers Blue Ridge Marathon on April 16th. Known as America’s Toughest Road Marathon, the Foot Levelers Blue Ridge Marathon will also be Abby’s first marathon. Of course, Abby is no stranger to athletic achievement. At the University of Richmond, she ended a stunning four-year career in 2012 as the program's seventh leading scorer (1,488 points) and the nation's best at the charity stripe (106-113, 94%). Abby was an All Conference first team selection after leading the league in points per game (16.5). She was ranked fourth in three point field goals (152), second in games played (129), eighth in free throws (296) and ninth in field goals (519). After college, Abby was recruited by Israeli professional team Elizur Netanya, where she played for one season. 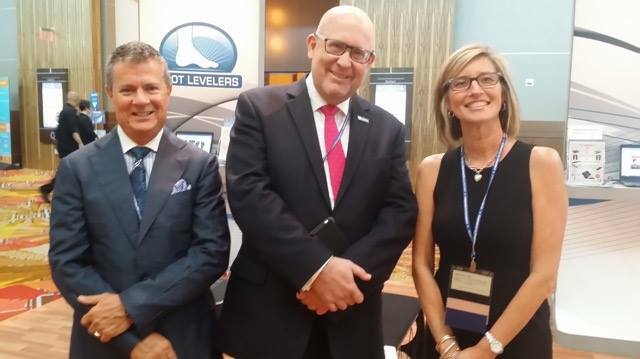 Foot Levelers, the world’s leading chiropractic supplier and manufacturer of custom orthotics, has been named as the WFC’s (World Federation of Chiropractic) new Premier Corporate Partner. ROANOKE, VA—October 21, 2016—Foot Levelers, the world’s leading provider of custom-made orthotics, has announced it is offering a FREE Fall Seminar, worth 12 Continuing Education (CE) credits, with the purchase of an InMotion® custom-made functional orthotic. Call Foot Levelers at 800.553.4860 for additional details. The company is also celebrating Chiropractic’s 121st birthday with a fantastic Buy One, Get One Free offer on its custom-made functional orthotics and custom orthotic flip-flops through October 31st. This special allows Chiropractors to put patients in multiple pairs of orthotics, helping to ensure their Kinetic Chain is supported in throughout every activity. *NEW! Custom Orthotic Waterproof Flip-flops: Ready to ship today! We’ve expanded our world- famous line of custom orthotic flip-flops with Fiji™ for her and Maui™ for him. Featuring a super soft insole for a “walk-on-water” feel; Aquatrek™ outsole to prevent slippage; EVA mid-layer to absorb heel shock; and a silky, chafe-free nylon strap in 4 exciting colors. *NEW! XP3+™: 100% custom-made support; ideal for those extreme athletes who go the distance. With double MPAX™ technology in the heel and NEW MPAX Pro™ in the forefoot, XP3+ reduces impact at heel strike and super-charges propulsion at toe-off. XP3+ provides results on the road, the track, the field–wherever they’re breaking records and killing the competition. Foot Levelers' Chairman and CEO Kent S. Greenawalt will deliver opening remarks on behalf of the Foundation for Chiropractic Progress (F4CP) on March 14th at the National Press Club in Washington D.C. Greenawalt, who is also the founder and Chairman of the Foundation, will speak on a topic that could not be more urgent or relevant today: the opioid epidemic in America, an ongoing tragedy with staggering implications on communities, families and the American healthcare system. Chiropractic, Greenawalt says, can lead the charge in reversing the horrifying trend. ROANOKE, VIRGINIA—July 11, 2016—Foot Levelers is excited to introduce its newest innovation in custom-made functional orthotics: AM7, designed for teens ages 13-18. Research shows that children and teens can benefit from orthotic support by helping to establish healthy posture early on. A balanced pedal foundation can also help prevent injuries and improve biomechanics. AM7 is available with Foot Levelers’ Posture Protect Program™, for savings with each replacement orthotic for the rapidly growing teen. It’s the perfect “step up” for young patients who have enjoyed the support and protection of Foot Levelers’ Ultra Young Soles®, designed for Ages 5–12. Ultra Young Soles® functional orthotics can help establish healthy posture as kids grow up, from the ground up. During growth, the normal development of the pelvis and the spine will suffer if there is a foot imbalance. Research shows a budding athlete’s skill level—even running at recess—can be significantly affected. Later on, foot problems from childhood can interfere with adolescent or adult spinal function, which can result in poor biomechanics and accelerated degenerative changes in the knees, hips and spine. AM7 and Ultra Young Soles are developed specifically to address these challenges and to protect the growing body. ROANOKE, Virginia — November 5, 2015 — In an effort to improve process time and to eliminate potential for injury from heavy lifting, Foot Levelers recently invested in two Roll Vertical Carousels by Summit Storage Solutions. The carousels help organize and dispense the large rolls of material (up to 28 inches outside diameter) used to produce top and bottom covers for Foot Levelers custom orthotics. These simple, sturdy carousels are operated using only two options, “Up” and “Down,” and replace forklifts, step systems and the need for complicated keyboards and interfaces that are hard to use and easy to break. This makes materials quickly and easily accessible to operators and removes the need for advanced training or maintenance, providing continual “uptime” and reducing costs. Foot Levelers custom orthotics are research-proven to treat low back pain and prevent injury, so the carousel investment is well aligned with the company’s mission and goals. Studies have also shown that custom orthotics, combined with Chiropractic care, improved symptoms, activities of daily living, sport and recreation, and quality of life in workers whose job requires them to stand at least 6 hours daily. (As an employment benefit, all Foot Levelers employees are provided with custom orthotics and encouraged to wear them daily). According to the Bureau of Labor Statistics, more than one million workers suffer back injuries each year. Back injuries account for one of every five injuries or illnesses in the workplace, and 1/4th of all compensation indemnity claims involve back injuries. The principal causes are “lifting, placing, carrying, holding and lowering [of] manual materials handling” according to the U.S. Department of Labor. Introducing New Vegas™ Custom Orthotic Flip-Flops, Our Most Dazzling Footwear to Date With Over 220 Stunning Rhinestones! What's In A Name? $1,000 - That's What! Foot Levelers' Revolutionary New Self-Scanning Technology Needs A Name - Submit Your Best Ideas For A Chance To Win! Foot Levelers Photo Competition is Heating Up—DCs are Invited to Enter to Win a FREE iPad By Sending in Pictures Today! New Flip-Flop Colors! Hear Them Roar!